Now that you’re going to be a GRANDparent, get GRAND delivered right to your inbox! Bumbum– That’s right! …my little grandson named me when he was 2. OK – my husband is HappyHahahahaha! Bubbies– My grandson was not quite two when he began calling me Bubbies. Biba– When my first grandchild, Emily, was born, we called me Grammy. pronounced beybey… He’s 10 years old now and still calls for his bebe..
Bakka– My son tried to say grandpa, and got bakka – it stuck and now he’s 3 1/2. set the standard for his younger brother. Baka– Our last name is Croatian and the Croatian word for Grandma is “Baka”. Babcia– We called my Mom’s mom the Polish version of grandma. BaBa– Our daughter adopted a 5 year old from Bulgaria. She is now 15 and so beautiful. She has always called me BaBa, which is grandmother in Bulgarian, and now two of our other grandchildren do. The others call me GranJan. Ba– My Great grandpa’s nickname was “Ba” because my dad couldn’tsay Grandpa Claude. Click here to get GRAND delivered right to your inbox. Access it anywhere and anytime! Click here to get GRAND delivered right to your inbox. GG – Is for Great Grandma. My youngest grandson was 4 when the first grand was born. We were very close and he said the new baby could not call me grandma…only he could. Our family was five generations of women then with my mom and mom-in-law being called Mom Mom and Nana, me Grandma to the grands and now GG to the great grands. Granana – for my new great-grandchildren, since i am already Nana to my grandchildren. Gramaria – My name is Maria. My oldest grandson named me Gramaria. All my grandkids and all their friends call me that. Grandma Jellybean – My nickname is Grandma Jellybean because when the kids were small I carried a bag of jellybeans in the car and they could always grab a handfull. Mamaw TT- I have been blessed to inherite my own grandmothers nickname, but due to both myself and one of the other grandmothers of my grandchildren, to help eliminate confusion we added my nickname I have being a aunt of 16 nieces & nephews which it is “Aunt TT” SO my grandbabies call me “Mamaw TT” There are no sweeter words on this earth to my ears like my grandbabies sweet voices say “awww my mamaw I wuvs u”. 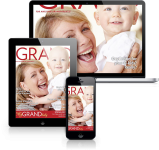 Download our app to access our GRAND Magazine from anywhere on any device! Oma – My step-grandchildren call me Grandma Sarah. Now my own grandchildren call me Oma. This German for Grandmother. Their grandfather and I had German ancestors and I wanted to be called something different from Grandma Sarah. My two grandsons call me Oma and have their friends do it too. Sammy -is my name. ! My 1st grandchild couldn’t say Grammy so Sammy became my new name. I love it!